UPTEMBER Week 2! Events – A betting pool – and Audio! Updraft has been out for a week! And what a week! My first Dragoncon! Panels! Reading! Signings! MAYHEM. Decatur Book Festival was wonderful! Great panel with my fellow Tor Author Cindy Dees! Plus, so far, I’ve seen Updraft reviewed in Turkish (! )*, heard that a friend can’t read it because her son stole it and wouldn’t give it back, and I’ve been asked many times when the next one is coming out. Folks are commenting on Goodreads and weighing in over at [the bookstore of their choice]. There are many more great reviews – I’ll be featuring some next week. That feels like a really great start. Add in enthusiasm over “Bent the Wing, Dark the Cloud,” set in the same world as Updraft, and I’m over the moon. Meantime, the online Uptember gifts continue, with flight class directions from Magister Dix at Dark Faerie Tales, a Torpedia.org entry on Skymouths, and one of my favorite podcasts, Skiffy & Fanty, where we ALMOST-don’t-talk-about-poop again. And today, I’m at Germantown Radio! Coming up – Rocket Talk, SCALZI, Booksmugglers (a special, illustrated treat is winging its way there now), Functional Nerds, and much more. 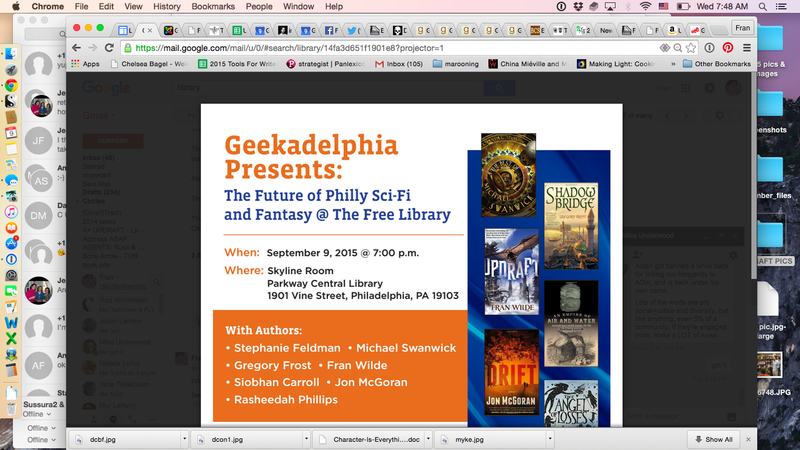 And the big thing is where I’ll be this week… the UPTEMBER tour starts up again tonight – with The Philadelphia Free Library’s Future of Science Fiction panel at 7pm. Host Jon McGoran asks the tough questions tonight – I’m really excited. Don’t miss it if you’re near Philly! Saturday night — CANNOT WAIT — I’m at Writers With Drinks in San Francisco with an incredible lineup, hosted by the amazing Charlie Jane Anders. Doors open at 6:30pm – see you there! I’ll keep posting links to things as they go up, and I’ll have a blog tour roundup at the end (though you’ll get it sooner if you sign up for the Secret Message Machine, which is about to go out and deliver audiobooks to several lucky subscribers). See you soon, and thank you again for your support for Updraft!